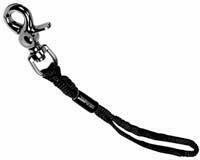 The Burton Quick Tool leash is simple to use and attaches with just a click of the buckle. Built into the tool you've got the 10mm wrench, phillips head driver and bottle opener, genius. View other products made by Burton.